We’d love your help. Let us know what’s wrong with this preview of The Power of Point of View by Alicia Rasley. Point of view isn't just an element of storytelling–when chosen carefully and employed consistently in a work of fiction, it is the foundation of a captivating story. It's the character voice you can hear as clearly as your own. It's the unique worldview that intrigues readers–persuading them to empathize with your characters and invest in their tale. It's the masterful concealing and revealing of detail that keeps pages turning and plots fresh. It's the hidden agenda that makes narrators complicated and compelling. It's also something most writers struggle to understand. In The Power of Point of View, RITA Award-winning author Alicia Rasley first teaches you the fundamentals of point of view (POV)–who is speaking, why, and what options work best within the conventions of your chosen genre. Then, she takes you deeper to explain how POV functions as a crucial piece of your story–something that ultimately shapes and drives character, plot, and every other component of your fiction. 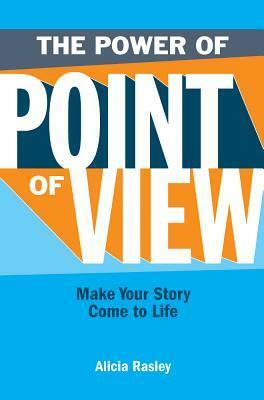 To ask other readers questions about The Power of Point of View, please sign up. I wrote this, and would be glad to talk about it. My blog about writing and editing is http://www.edittorrent.blogspot.com, so meet me there! Also lots of my articles about writing are archived at www.rasley.com. Understanding my creativity as levels within one point of view. I'd read and thought about this book for several months, pretty much thinking it was "4 stars" for not having enough examples to get it's ideas about pov across well enough for me to consciously apply them. Then very recently, pondering over a rare negative but constructive review of one of my fiction pieces, I think I finally got it. One of the complaints was about some of the language (esp expressive thoughts and perceptions) being o Understanding my creativity as levels within one point of view. One of the complaints was about some of the language (esp expressive thoughts and perceptions) being odd vs the rest of the. narrative. It was, I finally could see, my narrative sliding within differing levels of point of view from the same character. Regardless if it was an unfamiliarity by the reader with this more involving technique, or a less than adequate application of that technique on my part, the point is, it was a legitimate expression of sliding within some of the six levels of POV this author has identified. This has given me a self validation and understanding of my own creativity I hadn't expected. Essentially, despite still wishing there had been more examples, how can I not give 5 Stars to a guide that's stuck with me for months, and compelled me to understand some of my own creative writing intentions. There's much more about POV in this book, but this is what made it worth so much to me. The Power of Point of View goes beyond simply defining the various POV options and shows readers how to use POV to enhance and tie together all other story components The difference between a pedestrian telling of a story and a powerful telling is in how the point of view is handled. A well-written story is one in which the author allows POV to guide not just how the plot develops, but how the story--the merging of plot and character--develops. Someone enters my study with his jolly stride and rosy cheeks, his summer curls bouncing around a friendly face. He asks if he could have a look at THE book. I look at him and leave my work on the side. I’m knitting a sweater. Without taking my eyes off him I stand up. Slowly. I stand now stone-hearted, my hands are on the sides, ready. The small trembles of my fingers are the only movement of my body. I hold my breath. Suddenly, with the speed of a crazy cobra I pull out my gun and point it right between his sky shimmer eyes. The poor fellow twitches in fear. “If you leave a single greasy little fingerprint on IT I’ll ...” But I don’t get to finish because he is already running down the stairs. Screaming. I pull my gun back. My mouth mimics a smile and after restoring my inner balance I return to my knitting. It’s going to be a wonderful sweater. My niece will love it. That’s how much I like this book. This is an excellent book. I'm a fiction editor, working mainly with self-publishing authors, and I ALWAYS recommend this book to clients. It's extremely comprehensive, but doesn't fall into the trap of being dry or dull. If you're interested in writing fiction, I'd strongly recommend reading this book first. Even if you are an experienced writer, I bet you will learn something from it! Excellent tips on improving POV characters. It's interesting to read, considering POV. This is a great resource to keep on the shelf to improve any aspect of Point of View, filled with tips and examples, it's a tool both seasoned and new writers would appreciate. A must read for the writer. Very clear examples and direction on how to not get caught into the trap of the point of view merry-go-round. Some good tips on writing. One Person’s Point of View. Rasley, Alicia. (2008). The Power of Point of View. Cincinnati, OH: Writer’s Digest Books. When people hear or read a story, they want to know two things: What happens? And they want to know, Who is telling the story? That second question concerns point of view. If somebody is telling you a tale, whether around a campfire or over a cup of tea, it is important to know who this stoyteller is, what their attitudes are, and how they came to know of the events reported. In a One Person’s Point of View. When people hear or read a story, they want to know two things: What happens? And they want to know, Who is telling the story? That second question concerns point of view. If somebody is telling you a tale, whether around a campfire or over a cup of tea, it is important to know who this stoyteller is, what their attitudes are, and how they came to know of the events reported. In a work of fiction, these questions are usually implicit. Stories that just report events, with no consistent point of view, are much less interesting. The narrator is not, of course the author, but a quasi-character that the author has invented to tell the story. With a first-person point of view, the main character is also the narrator, such as in a mystery, where the investigating detective tells the story through his or her own eyes, with all the biases, attitudes, and errors that might entail. In a third person point of view, there is an omniscient narrator, a “voice” who is telling the tale but who is not one of the nominal characters of the story. This narrator directs the reader’s attention to scenery, characters, and costumes, as a movie director does, as well as relates development of the story and the characters in it. Rasley explains all the variations in point of view, and how each is used, in detail; and there are many variations on the third person omniscient POV to consider. Each chapter has interesting exercises that could be used in a classroom or by an individual, and a list of suggested further readings. This is probably the best book on the craft that I've read so far. It takes one subject, POV, and tells you everything you need to know about it. It shows what POV is, and what kinds of POV there are. It shows, for every kind of POV, what the advantages and disadvantages are of using that kind of POV, the dangers of using that kind of POV and gives several tips for writing in that kind of POV. All this is done in a very clear way with many great examples. Most of all, this book makes clear that This is probably the best book on the craft that I've read so far. It takes one subject, POV, and tells you everything you need to know about it. It shows what POV is, and what kinds of POV there are. It shows, for every kind of POV, what the advantages and disadvantages are of using that kind of POV, the dangers of using that kind of POV and gives several tips for writing in that kind of POV. All this is done in a very clear way with many great examples. This book was recommended to me by a group member when I posted a thread on multiple points of view and I'm glad I took up his suggestion. Well-written and comprehensive, "The Power of Point of View" covers the basics right through to the intricacies of "voice". As I'm currently writing a novel from a multiple of view, I found the last section "The Master Class" invaluable. I highly recommend it to all writers as it goes to show that the more you know the more there is to learn. Every Character Has a VoicePoint of view isn't just an element of storytelling�when chosen carefully and employed consistently in a work of fiction, it is the foundation of a captivating story. I was so excited to read a book by someone who is more geeky about point of view than I am, because most writing guides don't cover the topic in nearly enough depth. Rasley analyzes each possible narrative perspective and discusses when it might be appropriate for a story. Highly recommended if that sounds exciting to you, too. Very clear and detailed. Got a lot out of it especially as POV has always puzzled me ! Great examples for novices and multi-published writers. Deeply thoughtful and insightful about understanding POV. Read it in parts; the writing exercises were very helpful. If you write fiction or just love to read it well, a must-have book. Buy it, re-read it, take a master's class in the art and mystery of point of view. Brilliant. A very strong overview of POV, with a thorough and useful section on character voice to which I refer again and again. Highly recommended for new and experienced writers. I got this as a half-assed gift and didn't have the highest expectations, but it was decent for what it does.